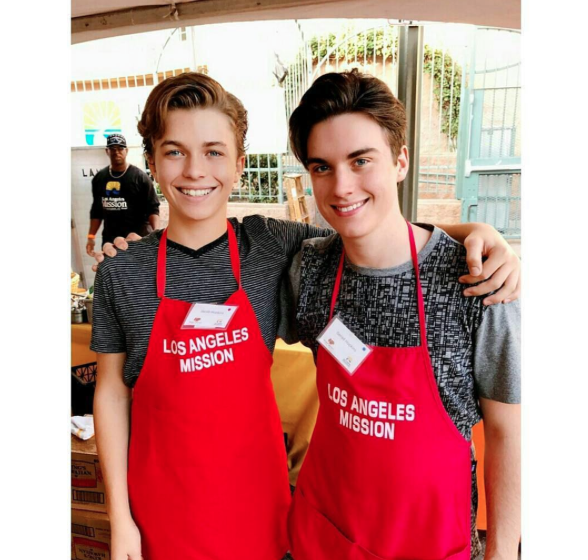 Article: Jacob Hopkins And His Brother, Gerad Had A Wonderful Time Serving Meals At The Skid Row Thanksgiving! Thanksgiving is such a wonderful holiday and everyday should be considered Thanksgiving as we should always be thankful and grateful for everything in our lives. Another magnificent thing about Thanksgiving is that it is a time for all of us to give back to others, and that’s exactly what the immensely talented and remarkable actor, Jacob Hopkins did on Wednesday, November 23, 2016. Jacob Hopkins had a phenomenal time serving meals at Skid Row’s Thanksgiving and had a terrific time volunteering and giving back along with his brother, Gerad, as well as Merit Leighton, Marlowe Peyton, and Brooke Lewis. Check out some more photos below of Jacob Hopkins at the Skid Row Thanksgiving! Comment below and tell me or tweet me at @alexisjoyvipacc, how did you celebrate your Thanksgiving? What are some ways you gave back for the Thanksgiving holiday? Follow Jacob Hopkins on Twitter: @HopkinsJacob5 and on Instagram: @HopkinsJake and check out our VIPAccessEXCLUSIVE updated interview below. Previous Article: Find Out What Grumpy Cat’s Top Ten Pet Peeves Are In Her First Ever Blog Post! Next Article: Brooke Lewis Looked Gorgeous Serving Meals At Skid Row’s Thanksgiving!